Older people are taking up BMX biking, inline skating and longboarding to keep fit and build a sense of community. Reporter Sue-Ann Tan, 23, tries to keep up. When Mr Jumaat Dedik had a mild stroke, instead of resting, he returned to a sport he once loved. He was about 47 years old then and the health scare was a "knock on the head" for him. "It was a wake-up call," the now 52-year-old self-employed BMX biker said. He used to take part in local BMX races in 1983 and 1984, but left the sport when he grew out of his teens. "We are considered granddads now in the sport," he said with a laugh. "I can't race like I used to, but going back to something I love so much reminds me of how I felt when I was 15." While others take medicine and supplements to combat ill health, Mr Jumaat uses BMX biking to build his health and regain the use of his body. "I was 85kg before my stroke and now I'm 65kg due to BMX biking," he declared proudly. "It's a great way to train my stamina and legs too. Now I can run up 10 floors of stairs. People go to the gym but I grab my bike instead." One thing that has changed is that Mr Jumaat has stopped doing tricks and stunts. "They are for the younger generation," he admitted. "I tried and fell a few times, and recovery can now take months instead of weeks." However, his friend, Mr Nazeer Ibrahim, is still doing wheelies, a trick in which the BMX bike's front wheel goes up in the air and the rider balances on the back wheel. The 53-year-old truck driver has been doing stunts and tricks since he was 12 and nostalgically remembers the old days when BMX biking was popular. "Us kids couldn't get big racing bikes, so the BMX was the closest thing," he said. "It's nice that some people have returned to BMX bikes. It's a way to gather old friends and even their kids join us. It's a great community." His own daughter, 25-year-old Nur Nasthasia Nadiah, has been BMX biking since she was nine and even competed in the 2010 Youth Olympic Games as a cyclist. He said: "We pass on this legacy to our children. I hope BMX biking stays alive in Singapore even when I'm no longer in this world." Keeping the sport alive and well is also Mr Mahmood Ahmad's desire. The 53-year-old taxi driver also cycled as a teenager but stopped in his 30s. When he was 50, he met Mr Azman Omar, founder of BMX biking community and online store Tuah Enterprise, who brought him back into the sport. "It was so difficult. I kept trying and forcing myself," he recalled. "People told me cycling is good for... slimming down, so I kept at it." 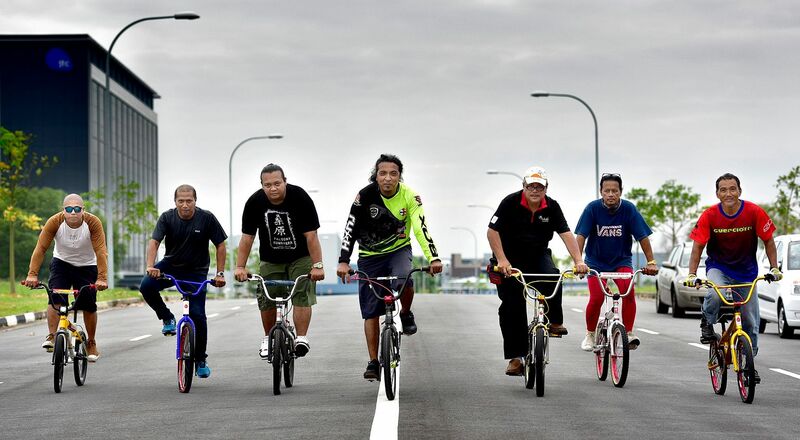 He hopes that Singapore opens a cycling track for them so they can continue BMX biking. "I have always loved this sport and it keeps me active as I age. It reminds me of the days when I was a kid and the old friends I made through BMX biking." He added: "I hope more people see how fun it is and get into it too."